Warranty: 2 Years; Power Supply: AC120V/230V, 60/50Hz; Power consumption: 50W; Beam angle:18°. Light Source: 15 W White compose LED; Dimmer: 0-100% liner adjustment; Strobe: 0-13 flashers per second. DMX Channel: 5/13 (from control panel to switch); Gobo wheel: 9 fixed gobo + 1 open white and rainbow effect. Control Mode:DMX 512, master slave, sound actived, auto mode; Pan:540°/ 360 °/ 180° (from control panel to switch); Tilt:270° / 180° / 90° (from control panel to switch). 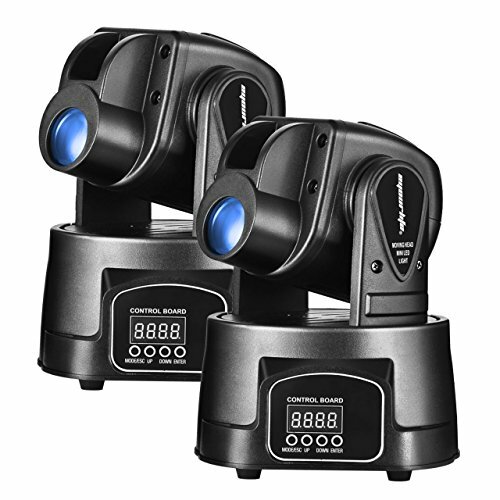 Ideal Moving Head Spot Lighting for Club, Dj show, Home party, Wedding party, Ballroom, Bands, Show bar etc. Package Dimensions(2 Items):18 x 11.5 x 10.7 inches; Unit Volume:1.282 cubic feet(2 Items Volume); Unit Weight:16.5 pounds (2 Items Weight).